"What Could've Been Night" on Friday, March 9th was a huge success! We raised a bunch of money for United Way of Erie County's Imagination Library and our fans consumed over 1,500 delicious pepperoni balls from International Bakery. A little about pepperoni balls. Ask anyone from Erie, Pennsylvania to describe a pepperoni ball and you will likely get a number of descriptions of baked or fried dough about the size of a donut stuffed with a few slices of pepperoni. Synonymous with Erie, pepperoni balls are made in several of Erie’s family-owned bakeries and Italian eateries. The pepperoni ball is a staple at nearly every Erie area sporting event and has even been sold frozen by the dozen for youth organization fundraisers. Erie loves our pepperoni balls! Use the hashtag #GoBiteWin to join the conversation in the feeds below! To outsiders, they might appear to be little more than dough and pepperoni. For those who grew up in the Erie region though, the pepperoni ball represents much more than that. As the Erie Bayhawks have recognized in their rebranding as the Erie Pepperoni Balls for an evening—an event to benefit the United Way of Erie County’s Imagination Library—the pepperoni ball is a staple of Erie’s cultural identity. These savory baseball-sized balls of homemade dough, which encase fresh slices of pepperoni, are legendary in the Erie area. In local school lunchrooms, kids line up on pepperoni ball day to—much to the disgust of pepperoni ball purists—smother their pep balls in marinara, ranch, and even hot sauce. What even makes an authentic pepperoni ball though? Not every Erie resident agrees. Should it be fried or baked? Fluffy or crisp? Stuffed with cheese or without? Served with condiments or enjoyed plain? Do they need to have those little ridges from the racks to be legitimate? “I like them baked and cheese is just an option,” Charles Brown, local hip hop artist, music producer, and writer, said. “I never thought to dip them in anything because to me, they’re fulfilling alone. Baked pepperoni balls with a glass of root beer does me justice,” he added. For many, there is a sense of nostalgia associated with eating pepperoni balls. “For better or worse,” Nick Warren, managing editor of the Erie Reader said, “the pepperoni ball that takes me back, my quintessential favorite, are the ones I used to get at concession stands for high school football games.” That’s a plain ball: no cheese, no dip, no nonense. “Baked, no cheese, just as it is—no dip needed,” Erie County Executive Kathy Dahlkemper agreed. Whatever way one decides to eat them, most will agree: they are delicious—and often linked with childhood memories. Sporting events. Lunchrooms. Afternoon snacks. A neighborhood bakery. Home. The exact origins of the pepperoni ball remain steeped in local mythology. Some have described them as a cousin to the pepperoni roll, which was popularized by West Virginian coal miners during the 1930s before spreading throughout Appalachia. However, the more one asks questions about the pepperoni ball in Erie, the more one recognizes two constants: Little Italy and fish balls. Decades ago, families and bakeries in Erie’s Little Italy were known for their fish balls—balls of fried or baked dough wrapped around scraps of fish… sometimes even anchovies. At some point, those scraps of fish were replaced with the simpler deli meat of pepperoni—an easy-to-make and even easier-to-eat snack that packed some serious calories. It was perfect for Erie’s working class. Many small local Italian mom and pop places began making and selling their own version of the pepperoni ball. Just a few of the establishments often mentioned by locals—some still around, some not—include the International Bakery (the official pepperoni ball of the Erie Bayhawks), Stanganelli’s, Arnone’s, Luigi’s, Pio’s, Barbato’s, Valerio’s, Bongiovanni’s, and Cassano’s. The list could go on and on. “My mom has been eating pepperoni balls as long as she can remember,” one woman whose family goes back generations in Little Italy said—but that was the extent of her pep ball knowledge. They’ve just always been here, it seems. Gordie Art Evans, owner of Art’s Bakery on West Ridge Road, believes his bakery started making pepperoni balls sometime in the late-1960s. Pepperoni balls continue to be a local favorite—however one chooses to consume them. The beauty, perhaps, is in how versatile they are, and how, if one chooses, it is simple enough to make at home. Stronger and with more delicious local cuisine—because frankly, the pepperoni ball is another reason you can’t beat living in Erie, Pennsylvania. The Erie BayHawks became the Erie Pepperoni Balls for one night, and the fans ate it up. I was skeptical as I entered Erie Insurance Arena to watch the long-awaited debut of the Erie Pepperoni Balls. 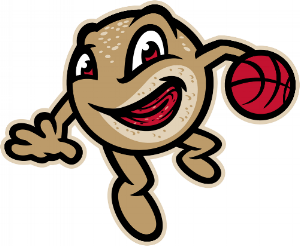 As “What Could Have Been Night” began to unfold Friday, I wondered if there could have been a better way to grab the attention of local sports fans than to imagine an NBA G League basketball team named after a tasty treat made of pepperoni, cheese and dough. On the surface, it seemed like way too much of a gimmick to succeed. I cringed at the thought of what I would see that night. Now as I reflect on what I witnessed at Erie Insurance Arena, it’s a good thing I wasn’t in charge of handling that promotion, because this one attracted more than 4,000 fans to the game, sent many people home with Pepperoni Balls T-shirts and jerseys, and as I learned at the end of the night, sparked a sellout of pepperoni balls at concessions stands by halftime. By the end of the evening, I was pleasantly surprised with how well the promotion worked, and I shared that sentiment with Erie BayHawks team president Matt Bresee afterward. My assumptions going into that night were wrong. In hindsight, Bresee and his staff deserve credit for taking a chance. Erie can be a challenging sports market, especially in the winter when weather gives casual fans a reason to stay home. Winning helps attract a larger fan base, and the BayHawks have a winning record, and are closing in on a division title this year after a few seasons of struggles. But providing a winning product is only one part of a local team’s success off the court, ice or field. Giveaways, autograph sessions and other common approaches sometimes to attract aren’t enough either. Sometimes, local clubs need to take a risk. They need to try something different, and turning BayHawks into Pepperoni Balls for one night is different. It worked, beginning with the jerseys and T-shirts. The BayHawks made pepperoni balls look good, and not simply because the team beat the Maine Red Claws that night to move one step closer to reaching the league playoffs. Based on the number of fans on hand, it seemed Erie natives young and old appreciated the simple yet stylish design. The players seemed to enjoy the promotion too, because the Erie community supported it.